Motorola Moto E3 Power was released back in 2016, September with Dual-Sim mechanism. It is equipped with 5.0 inches display supporting resolution of 720×1280 pixels covered by protection. The phone include quad-core 1.0 GHz cortex-A53 processor with 2 GB RAM to increase the performance of the phone. Contribution to storage, the phone is packed with 16 GB of internal memory and also support micro-SD card upto 32 GB. 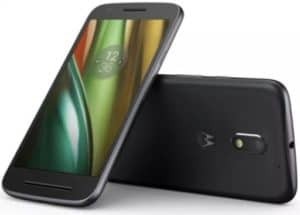 when it comes to camera, Motorola Moto E3 Power include 8MP Primary camera including features and 5MP secondary camera. The phone is packed with Li-Ion 3500 mAh battery. The connectivity medium include WLAN, Bluetooth, GPS, Radio and USB. The price of Motorola Moto E3 Power in india is 7,999.